In The Air, Tonight (2014-), an ongoing initiative in its third year, aims to encourage a larger discussion on the topic of homelessness in Toronto using light, social media, and architecture. Every time someone tweets using the hashtag #homelessness a red pulse appears on the LED façade of the Ryerson Image Centre in downtown Toronto. Every time someone donates money, the building glows white. In between, a In between tweets and donations a blue wave-like animation appears changing with the wind speed and direction. 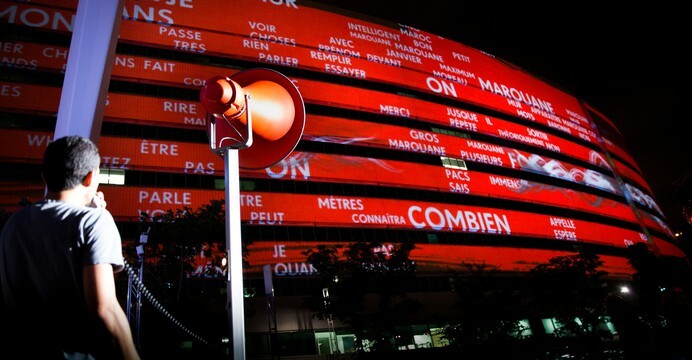 In The Air, Tonight used a programmable low-resolution architectural façade in Toronto, the Ryerson Image Arts Centre, to display a blue wave representing local wind speed and dierection and a red pulse triggered by the ongoing conversation around #homelessness on Twitter. The installation also glows white when a donation is made to the STAR learning centre, an organization that helps people with lived experience of homelessness transition into meaningful employment and stable housing. This installation uses data visualization, media architecture, and the city to dramatize an important conversation around this pressing issue. Experiencing key traces of information at an architectural scale can help to create emotional and embodied connections in citizens to common causes and concerns expressed by that information. Resolution and transmitting behaviour : Low resolution – 1400 LED light modules (each 15-20 W) are integrated into custom brackets on the exterior of the building which support glass panels. Each panel becomes an illuminated pixel by night; the lighting is programmed to create color flows that travel around the building to emphasize the wraparound facade. Luminace : Medium brightness - the facade operates after sundown. Urban situation : This building is just one block away from the centre of the city and at the centre of one of the highest concentrations of drop-in centres and homeless shelters in the country. It can be viewed locally from street level and from many of the high-rise buildings surrounding it. Description of showreel : The facade displays our artistic intervention using the facade. We explain the rationale, function, and goals of the project.